POLL: Which Rissa Hairstyle for the Photo Shoot? 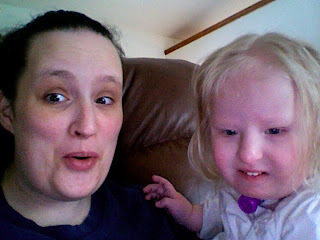 Hopefully, if the fates allow, we will be having a photo shoot with an awesome photographer and fellow special needs mom, Tamara on Saturday, May 9th. Tamara participates in a wonderful photography project for special needs kids and their families called The Littlest Heroes Project. Tamara and I have been working on getting this shoot scheduled for about two months now and because of surgery recovery, illness, out of town trips, holidays, and just our everyday busy lives, we have not been able to get it done yet. We are hopeful May 9th will work for all of us. In preparation for the photo shoot, I am asking all of my readers to participate in a poll on how Marissa's hair should be done. I have posted two photos of each hairstyle to choose from and numbered them 1 through 9. If you would, please leave a comment indicating which hairstyle you think Marissa should wear for the shoot. Since it was already 70 degrees at 10:00 am here in lovely Colorado, I decided to un-tarp the good ol' back porch swing and take Marissa out for some Springtime fun! Telling me that we should go "outside"!! Thanks for the absolutely adorable outfit Auntie Katelynn!! "Ummm, helllllooooo Mooooommm!!! It is way too bright out here for my precious little eyeballs!!!!" One happy little Colorado Spring Chick! Much Better Night... Much Better Day? Yesterday was pretty bad. She threw up three more times. Because of the excess secretions, she would cough real hard, gag and throw up. We kept her on Pedialyte all day and then did half Pediasure, half Pedialyte for he night feeding. She did stay hydrated though, so that's a bonus! Her diapers started to get back to normal by last night, so we'll see if we've reached the end of that roller coaster. As for the hitting, it is purely behavioral. 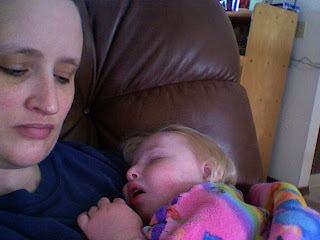 We have been having this problem for a few months now, but it is always worse when she is sick or after surgery. She only hits Jeremy and I, every blue moon she'll hit Michelle. 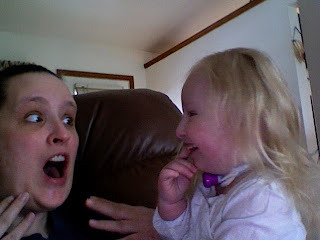 She mostly hits me though because I am always with her and I have to discipline her more. We have been trying different things to curb this behavior and it has been getting better now that she is verbalizing more. We and her pediatrician believe that the hitting is due to her communication issues. Even though she knows a lot of signs and is talking quite a bit, most kids her age are able to communicate their wants and needs better than she is. She is fiercely independent and she knows what she wants when she wants it. It is so frustrating for both her and us when she wants something and is trying to tell us and we just don't get it. Plus, she has a STRONG family history of major "terrible two" issues! ;) Yesterday morning, with everything else that was going on, the hitting was amplified and so was my intolerance of it. We'll get through this, just like everything else. So, with the exception of her waking up once, right as Jeremy and I turned out the light ourselves, last night was astronomically better than the night before. She slept all night long and even had to be woken up by me this morning at 7:45! She always wakes up first! She is in physical therapy right now and is in a MUCH better mood. I haven't even been hit once this morning!! 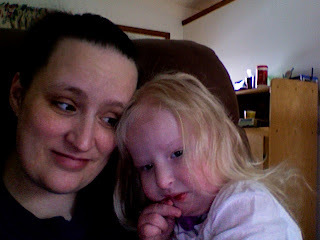 She has also not thrown up yet today, so I am pretty hopeful. Thanks for all the support and well wishes. It helps more than I can say. On a completely different note, I have another prayer request. 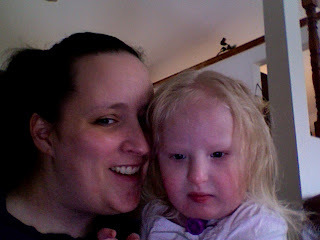 There is a sweet little one named Kayleigh who has been struggling since she was born ten months ago. She has lived in the hospital the whole time but it looked as though she was doing well enough to go home soon. 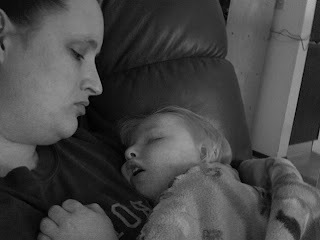 Things took a drastic turn for the worse and, well, my heart is too heavy this morning to type any more about her current condition. 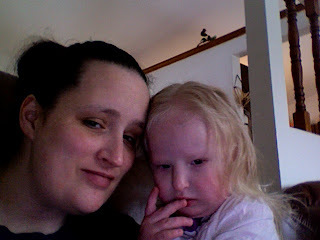 Just please go to Kayleigh's blog and pray with all your might for a miracle. Pray that God will show the doctors how to proceed and that He will wrap His loving arms around Kayleigh's wonderful parents and family. 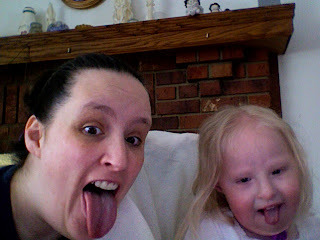 I try to teach Marissa the names of all the kiddos I follow on the computer, and I have done the same with Kayleigh. Marissa will only call her "hands". You'll see why as soon as you go to her site. Marissa was up every hour, on the hour, starting at midnight. She (and we) got up for good at 3:30 this morning. 3 pukes, 2 baths, and 5 loads of laundry later, I am not anticipating a very good day. She is still craving her daddy and does not want anything to do with me. My feelings are not hurt, but I am tired of her slapping me. 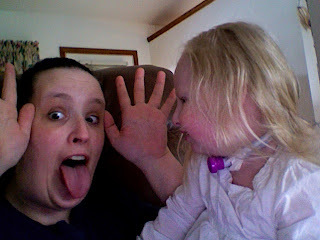 Yes, you read correctly, she slaps me, for no reason. Just hauls off and hits me. No provocation. No warning. I know she does not feel good, but c'mon. OK, so this post isn't about me and my stinging face. Please pray that Marissa can keep her fluids in. I do not want her admitted to the hospital because she is dehydrated from puking. And the puking can't feel good on her throat. Please also pray that the poop roller coaster has come to a stop. She seems to follow this pattern when on narcotic pain meds: constipation, needing suppositories to make her go, a few hard and difficult poops, then diarrhea and a bad diaper rash. My poor girl, I feel so bad for her. I would take it all on myself if I could. One last prayer: Please pray for Stellan. He was just intubated and put under for a three hour, very risky surgery on his little heart as I type this. Pray for his family and for the doctors. If you can, wear orange today in honor of him. Pay close attention around 1:2o in the first video. This was the first time Marissa tolerated the PMV (speaking valve). These two videos stop me in my tracks every time see them. It was so awesome to finally hear her voice. Please pray again for Stellan and his family. It looks like he might have heart surgery tonight. Click on this link, read up, and pray. This little guy needs all the help he can get. Emerson continues to do well, with some setbacks here and there. Please also keep her in your prayers for her long road of recovery. Marissa's recovery is going pretty well. We got close to taking her to Urgent Care yesterday morning because she had slightly yellow secretions and she was acting lethargic. We were concerned that Friday night's humidifier dumping episode had caused pneumonia. 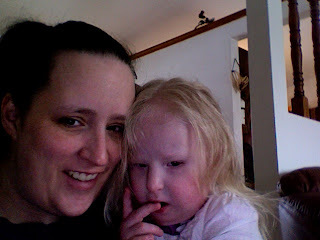 We were torn because we did not know whether her symptoms were from surgery recovery or the beginning of pneumonia. We waited and... she had a very large dirty diaper. The second after she dirtied her diaper, she was chipper, cheery, laughing and bouncing off the walls again. She had two more blowout diapers yesterday, some of which got on Jeremy's arm. Last I heard he was going to soak his arm in rubbing alcohol and set it on fire!!! ;) Her secretions have thus far stayed clear, so I guess all she needed to do was get rid of all that poop so she could feel better!! I think I am safe in saying we finally turned the corner away from pneumonia. Yay!! This morning she is VERY grumpy. She was very clingy with her daddy all weekend and I am NOT her favorite person today. For no particular reason. 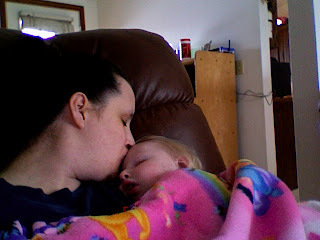 She fights me on even the most mundane of tasks and I know if her daddy were doing it, she would have no problem. Oh well, We'll both just have to muscle through this. We all had a very good night. Marissa slept the whole night through, probably due in large part to the Tylenol with Codeine. Jeremy and I would have slept the whole night through if we didn't have to get up and give her pain meds at 12 am and 4 am. Marissa woke up and was happy one minute and grumpy the next, probably due in large part to the fact that it was still 1/2 hour till she got her next pain med. Right now, she is up and about, being her feisty little self. We are going to enjoy a pajama day while we watch the snow fall outside. Weird that we have had more snow in the last month than we had all Winter! Ahhhh, springtime in the Rockies! We are going to start alternating regular Tylenol and Tylenol with Codeine to try to alleviate some of the constipation Marissa is already dealing with. Pay close attention to the next three pictures. First, glasses on, Marissa with a "can you guess what I'm gonna do next?" look on her face. Next, glasses off, Marissa with a very guilty look on her face. Telling the nurse to "take a hike!!" The first three videos are of Marissa on Versed (pronounced ver-said). She got the Versed before she went into the OR because she is always so anxious when she gets to the hospital for a procedure. I have never had the pleasure of taking Versed, but from judging how Marissa acts, it's pretty good stuff. 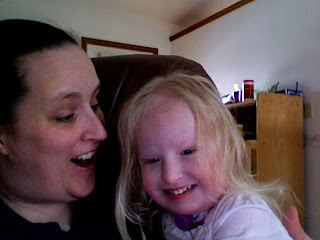 There were several times we were watching TV or a movie and she would just stop what she was doing and stare intently at the screen, as if she was seeing a parade of pink and purple polka-dotted elephants. Trippy!!! The last video is of her post-op. Well, That's Cool, But... Dang!